After reading so many dramatic books, Shug reminded me that there is plenty of drama in the daily life of a middle schooler. 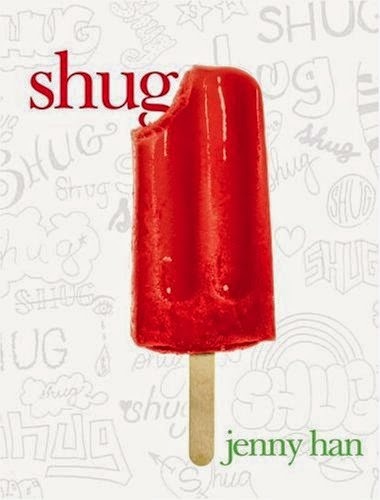 Shug is a southern girl who is struggling with the changes that come with growing up. She finds herself always one step behind: still wearing a one-piece when everyone else is in a bikini, still hoping for fried chicken when all the other girls are on a diet. Adding to her confusion is a crush on her lifelong best friend, Mark and increasing marital issues between her parents. That's it. No zombie viruses. No tragic parental deaths. Just the challenging business of being twelve. When a writer is as talented as Jenny Han, that's enough. This middle grade novel is different from her usual books, but her insight is exactly the same. She knows her audience when she writes, "Losing a boy best friend is one thing, but losing a girl best friend, your true best friend, is a whole different story. It's like losing a rib. There's something missing inside of you that you didn't even realize was there, and it makes it hard to breathe." It's passages like this that will really connect with my students; it's passages like this that made me order multiple copies for next year.